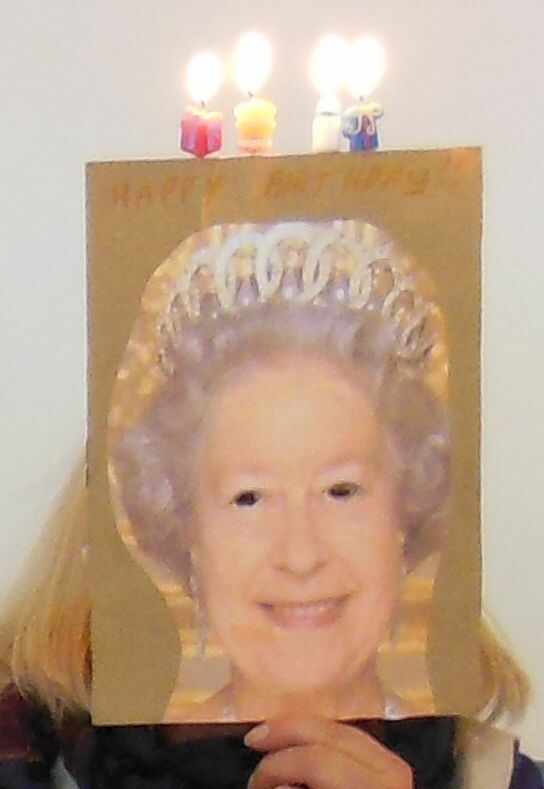 What a day we had on the Queen’s birthday, sadly Her Royal Highness couldn’t make it herself but Chris Hughson came to the rescue, good on you Chris. While it rained and blew a cold wind outdoors we were busy and cosy in the hall, feasting on all manner of warming food while we chatted, laughed, shared our skills and bought or bartered our treasures. Thank you to all the domestic goddesses who plied us with all manner of nibbles, soup and bread. Thank you to our Royal Barista team Tony and Irene. Thank you to everyone who contributed to the Buy or Barter table – alpaca poo, champagne goblets, jams and chutneys, alpaca fleece, bunny fleece, books, shirts, plants and earrings – and thank you to everyone that contributed to show and tell – it all adds up to fun and love. Jennifer showed some of us how to craft the Duplicate Stitch while she added detail to those fabulous Raincloud socks. Leslie G showed several folk how to felt a flower, Shirley showed someone how to proceed with a sock, and the crowd sang Happy Birthday to The Queen! Michelle has borrowed the Crafters Carder so we are anticipating Felted Wonders in the coming meetings. Tasmanian Craft Fair in Deloraine beginning October 30th, if you are a Guild member you may offer up to 10 items for sale on the Guild table, ask Shirley about that. Royal Hobart Show beginning 21 October, your work is fantastic, enter it. Huon Show November 14th, enter some of your fabulous items. The next meeting is scheduled for Monday 13 July. The meeting after that, the August meeting, will be attended by organisations affiliated with The Society for Creative Anachronism with perhaps some examples of their clothing, weaponry and tools. Want to look them up, see The Canton of Lightwood, and The Barony of Ynys Fawr. So all you weavers, spinners, rope workers, knitters, knotters, potters, woodworkers, bone workers, leather workers and kitchen experts, let’s make them very welcome with our medieval show and tell items, and perhaps some medieval morning tea fare???? Grasses from Old Beach, do you know what it is? Sue’s scarves, crafted with Dowpaca alpaca yarns. Felted flowers by Lesley G, works of art. Detail of Maree’s scarf, chunky commercial wool warp with weft of handspun homegrown angora bunny fibre dyed to match, a family spun affair with grandchildren helping out. Sues’ socks showing her sock template. Valeri’s socks, showing the Sox Therapists Fish Lips Kiss Heel. Wilma’s scarf – doesn’t it make you think of pretty parrots flying thru the air? Zoe’s woven scarf – brilliant.